Helen and John got married in the Hillbark hotel in December, a Wirral wedding venue I’ve visited many times and love shooting, but on this occasion the ceremony was late on, 3pm. I wanted to catch the light before it faded away in order to shoot the Bride and Groom portraits. 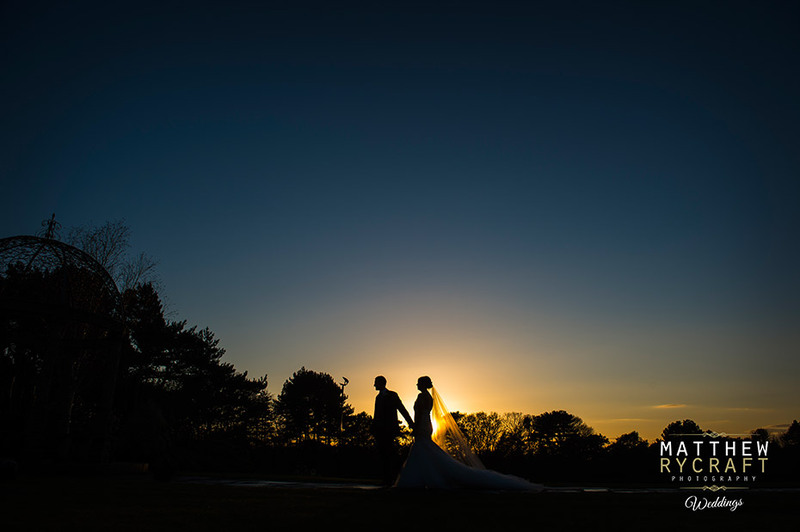 We went straight out after the ceremony, to be presented with the most fabulous sunset, and a Hillbark Hotels Wedding Photographers dream, the “Golden Hour”. Timing is incredibly important and keeping an eye on the weather is what I consider to be an important job for the wedding photographer. We always create a timeline for the day in our last consultation with the bride and groom 6-3 weeks before the wedding, this helps in situations like this where timing is key to get the best shots possible. I’ve selected a few wedding photographs that show the Hillbark Hotel off as a beautiful wedding venue. Also included are a few nighttime shots, an absolute must for any Matt Rycraft Bride.